Suppose you had ten teams of high class scientists assessing the same 141 countries each by its own criteria without knowing each other. One team is assessing ‘enabling environment’, others estimate ‘competitiveness’, ‘human development’, ‘social progress’, ‘prosperity’, ‘giving’, ‘ecological footprint’ and ‘peace’. Team no. 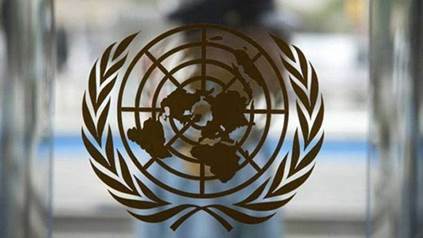 10 is assessing the progress of countries in meeting the 17 Sustainable Development Goals (SDGs) approved at the UN. After their assessment they publish their country ranking from 1 to 141. If two of these indexes rank the same countries in the same order, a statistician will say they are “redundant”, which means that somehow they ended up measuring the same thing even if under different names or through different proxies. If one index ranks a country as number 1 and the other as 141, the statistician will observe that this country has the maximum possible “standard deviation” (which in this case is 70). 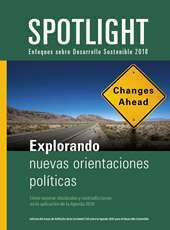 If we have ten independent teams measuring ten different things we can expect some of the results to be redundant (for example, better education for girls correlates with lower infant and maternal mortality), while others show deviation: low income equality, for example, can be found both in very rich and very poor countries. Yet, when we compare the new index with the Global Index Benchmark that summarizes ten leading global indexes, we find two astonishing statistical aspects in its ranking: high redundancy and unilateral bias. The indices bringing up this surprising result include per capita GDP and others that have been developed within two decades and claime to measure ‘beyond GDP’: Peace. Education. Health. Democracy. Environmental protection. So why are they strongly correlating with GDP? We may suspect that countries with a strong GDP may be more capable to finance public goods that as a result affect life expectancy, health, environment, education and security. But the 2030 Agenda of the UN that includes the SDGs and has been signed by all 193 countries of the world it was made explicit that this was a new development paradigm, transformational and universal, where no country can claim to be “sustainably developed” When the same countries that lead the GDP tables are also leading both in the SDGI Index and in the Global Index Benchmark the sub-message is clear: ‘We are at the top of whatever is being measured’. Within the complex environment of the SDGs, that include goals such as ‘reduced inequalities’ (SDG 10) and ‘peace’ (Goal 16) and addresses countries in poverty, crisis and conflict, this may be the wrong message. It makes no sense to measure the goals in ways that citizens and governments can’t influence by their existing resources. 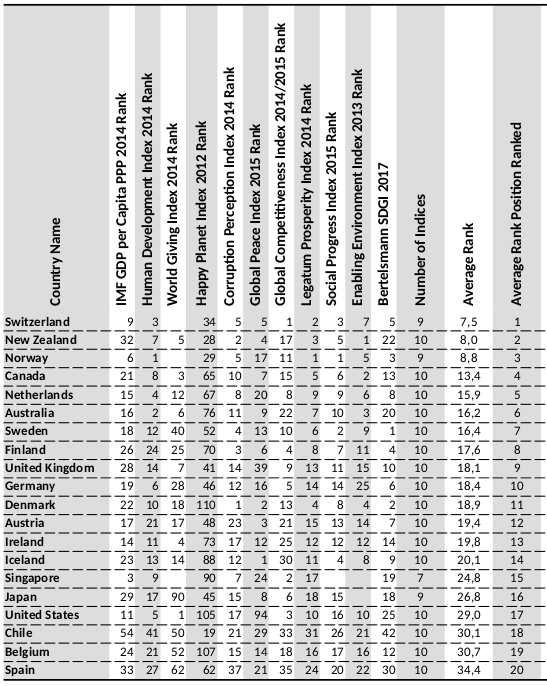 Coincidentally, all ten indices that favour countries with a low standard deviation within the Top-20-ranking are made in and by countries that lead the Index Benchmark: Switzerland, the UK, Germany, US and Australia. So will the measuring of Agenda 2030 become an exercise where Germany certifies Sweden, the US, the UK and Switzerland as meeting the SDGs? We need to rethink the process of measuring the SDG immediately. Otherwise the wrong message provided today will lead to frustration and another unfairness towards developing countries.